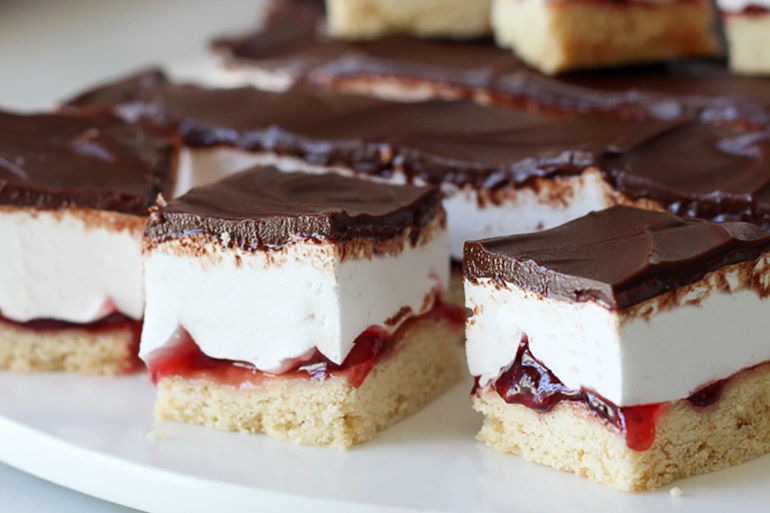 It’s a great time to be alive when you can create a slab of Wagon Wheel slice in your own kitchen. All the marshmallow, all the jam and ALL THE YUM! Perfect for sharing, this Wagon Wheel slice is sure to be a hit. 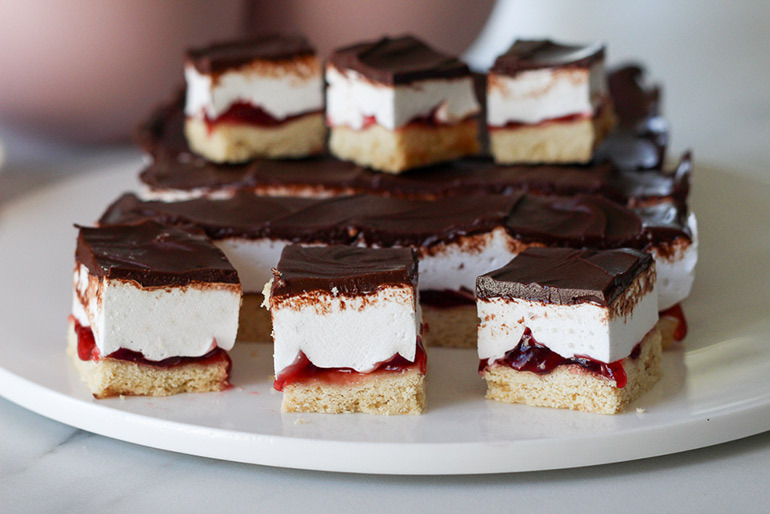 What could be more pleasing than a slab of layered biscuit, jam, marshmallow and chocolate goodness? We’ve given you recipes for Twix biscuits and Tim Tam balls and now it’s the Wagon Wheel’s turn. Now before you think it’s far too difficult of a recipe, let me reassure you it’s anything but! Preheat the oven to 160°C. Grease a 16cm x 26cm slice tin. Line the tin with baking paper, allowing the paper to extend up over the sides of the tin. Extending the paper makes it easy to get out later on! To create the base, in a medium saucepan, melt the butter over low heat. Increase the heat and allow butter to froth, stirring constantly until it starts to brown. Set aside to cool slightly. Pour the cooled butter into a large bowl. Add the sugar, egg and vanilla bean paste and mix together well. Add the flour, baking powder and salt, stirring until dough comes together. Press the mixture into the base of your prepared tin. Bake for 15 minutes or until golden. Leaving it in the tin, spread the warm biscuit base with the jam and set aside. To make the marshmallow, place the water in a medium saucepan and sprinkle the gelatine powder over the top. Do not stir it – allow to sit for 10 minutes. After 10 minutes, whisk the gelatine and water mix with a fork. Add the caster sugar to the gelatine mixture and gently dissolve it over low heat, increasing to medium heat without stirring for 5 minutes. Remove the pan from the heat and allow to cool to room temperature. Mix in the icing sugar. 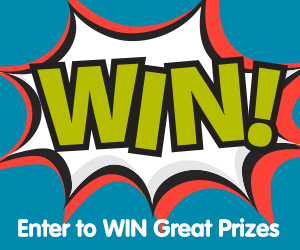 Using an electric mixer and a large mixing bowl, beat the marshmallow mixture until thick and white – up to 5 minutes. Add the vanilla bean paste and mix in well. Spoon and spread the marshmallow over the top of the jam covered biscuit base and place in the fridge to set. The final step is making the chocolate top! Place the chocolate and butter together in a heatproof bowl. Place the bowl over the top of a saucepan of simmering water over low heat (don’t let the water touch the bowl), and stir until completely smooth. Spread it over the marshmallow layer. Refrigerate until set. Stand at room temperature for 5 minutes before cutting into pieces and serving. Tip: Use a hot, dry knife to cut through the slice easily. An original Queen recipe, this slice yields 24 pieces. For even more sweet treat ideas, check out our delicious collection of slice recipes. You’ll have afternoon tea covered in no time. Yum!